For multiples of 1 oz copper, say 2 or 3 – just multiply above preferred unit of measure by the desired multiple. 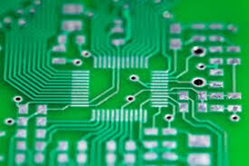 Generally, PCBs are fabricated with 1 oz copper thickness as a default, unless specified otherwise. If a design requires more current carrying capability than 1 oz can handle, increase the copper weight or width of the trace. Tighter spacing is possible with engineering review. Follow the above as guidelines only. In the long run, maximizing the space between copper features improves manufacturability, and lowers cost.